An on-going appreciation of writer-artist-editor Jack "King" Kirby! The creator or co-creator of the Marvel Universe and more comics and characters than you can shake a stick at! I recently scribbled a few words in praise of the internet’s very own Jack Kirby forum better known as “Kirby-L” and that prompted a little feedback but in particular I was thrilled to hear from Chrissie Harper -- who way back in the day (actually April 1996) -- got the whole Kirby connection up and running on the internet. Let it be said, that when it comes/came to getting Jack Kirby a “presence” via the internet and in fanzines, Chrissie is/was -- one of the “pioneers” in the game. Remember that despite the Jack Kirby Collector being one of the most widely accepted Kirby resources around today, Jack was -- unfortunately -- not alive to see and enjoy it. Harper’s ‘zine, entitled Jack Kirby Quarterly had the distinction of getting Jack’s seal of approval. At least for an issue or two. Anyway -- I imagine that Kirby-l was a natural extension of Chrissie’s zine and despite Kirby-L changing hands and having a revolving door of members, it couldn’t have gotten to where it is today without Chrissie’s efforts! Anyway – it was great to hear from Chrissie and nice to know someone is out there reading this thing! And as far as Kirby-L goes, it’s a great stepping stone for instant immersion into everything Kirby and comes highly recommended. And speaking of Kirby-L, it’s always nice to pick up a tidbit or two of Kirby-information and one of the recent posts echoed the news that DC will put out an OMAC TPB in early 2008! 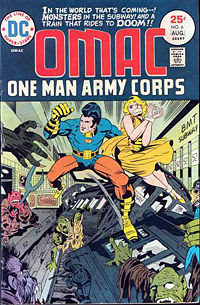 I enjoyed OMAC early in it’s run when it was inked by Mike Royer. When D. Bruce Berry picked up the nibs the series went nowhere, but OMAC regained the ‘ol magic when Royer returned for the last issue or two. No doubt I’ll be looking for the OMAC TPB when it hits the street! I’m really jazzed about the soon-to-be-released Marvel Masterworks album, “Fantastic Four: The Lost Adventure.” I’m excited about this project because not only is it the closest thing we fans are gonna see that resembles “new” Jack Kirby artwork but it also re-teams Jack and Stan Lee -- a match we haven’t seen since the Silver Surfer graphic novel they produced way back in 1978. 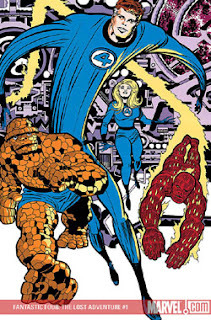 What really excites me about Fantastic Four: The Lost Adventure -- and I’m probably preaching to the choir here -- is the fact that this effort represents another gesture on the part of Marvel to set things right between themselves and the Kirby estate. Now, I’m not sure if the playing field will ever get leveled when it comes to Jack Kirby and his endless contributions to the Marvel mythos, but between the Lost Adventure and Jack Kirby’s Galactic Bounty Hunters, at least the Kirby estate (via Lisa Kirby) and Marvel on as good of terms as they are likely to ever be. It’s also nice to see that John Morrow and the Jack Kirby Collector play an important role in all this. You can read all about the Lost Adventure in a cool interview with Marvel’s Tom Brevoort by clicking here. A new discussion thread poked it’s head out the sand on the Kirby-L internet discussion forum, and it has to do with the Jack Kirby book that came out a few years back entitled “Tales to Astonish” and written by the infamous Ronin Ro. I’ll leave my comments on the Ro book until later in this thread, but the Kirby-L discussion has got me wondering if there will ever be a “definitive” Jack Kirby biography. I’m as anxious as the next Kirby fan to see Mark Evanier’s much anticipated Jack Kirby biography -- if and when it ever gets published, and speaking of which I’m not really sure how to classify the Kirby tribute book that Mark has coming out in February ’08. The Kirby bio and the tribute book are two different entities. In the meantime though, it dawned on me that the closest thing we fans have to the “Jack Kirby Story” can be found within the pages of John Morrow’s always-entertaining Jack Kirby Collector. I consider the JKC to be an on-going look at the life and times of the King. Granted, a lot of times JKC has a bit of redundancy to it. It seems like no matter how many interviews Jack gave he rarely shed some light on anything “new” and Jack’s early years have been played out dozens of times in any number of articles. Still, I’m grateful for the JKC because the magazine has provided many of us with a sort of bedrock in the life of Jack Kirby. Which kind of allows me to segue into a bit of commentary for Ronin Ro’s Tales to Astonish. There was very little that I recall in Tales to Astonish that was original. I mean -- I wouldn’t exactly call the effort a product of deep research. It seemed like Ro culled most of his information from other interviews and articles and even pulled some discussions from Kirby-l and then he mixed it all together and called it a “book.” Furthermore, I don’t recall TtA presenting Jack in an especially positive light, nor do I recall walking away feeling like I learned anything. There was a passage or two at the end that dealt with Jack’s untimely passing that was more than I expected but otherwise I was glad I read it in an afternoon --for free -- at the local library. Which is what I recommend you do as well. Tales to Astonish can probably be picked up cheap on eBay or any number of other discount book sellers. (I just did a quick search on Amazon.com and found used copies for about $2.50 here). It’s not for me to say what the exact merits are concerning Tales to Astonish. I just feel that if you really want to learn about Jack Kirby you can do so by turning the pages of the Jack Kirby Collector. That is at least until Mark Evanier’s book comes out. I hope. I admit it -- I picked up the Devil Dinosaur Omnibus Edition recently (on eBay) more for nostalgic reasons than because of any particular artistic or literary merit due the series. Back in 1978 or '79 or whenever it was Jack produced it this mini-epic, I had no idea that Kirby pretty much had his foot out the door -- that he was at the tale-end of a three-year contract with Marvel Comics and Devil Dinosaur represented part of his 15-pages-of-comic-art-a-week obligations to the company. At any rate I thought the series was fun. But I was probably a little too old to appreciate it at the time. But here it is 30 years later and now I'm a father with a daughter who not only likes to read but who also loves dinosaurs. What better excuse than that do I need to pick up this nicely-produced edition that packs all nine of 'ol DD's adventures in one easy-to-read volume. There's only one flaw in my humble opinion. I don't understand the introduction written by Marvel big guy Tom Brevoort. Now Tom is a nice guy. I never had the pleasure of meeting him but he always provided great commentary when he participate in the KIRBY-L online forum a while back and he has been in instrumental in his efforts to get Kirby's mid-1970's material reproduced. But his tone in the Devil Dinosaur volume is almost apologetic. I can think of a lot of great things to write when it comes to Jack Kirby and I can certainly come up with enough superlatives to fill a page-and-a-half intro to this Omnibus edition. So why does Tom spend his time basically telling us that Jack's mid-70's titles all failed, that the inking and writing weren't what the fans were asking for or that Devil Dinasaur was the impetus or a proposed animation series for Saturday morning. Why not focus on the positive? Like how Jack could find a unique angle for any genre, how his imaginaiton in Devil Dinasaur is unbridled or that the series is just plain old fun. Apparently the folks at Marvel decided to sell the book shrink-wrapped so they wouldn't risk anyone opening it up and not enjoying the contents. 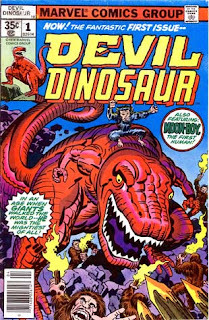 Well let me tell you -- Devil Dinosaur holds up a lot better now than a whole bunch of whatever "dark" comics that were being published at the time. And if you have the cash and especially if you have young kids than I say Devil Dinosaur is a worth the money. I just ask you to ignore the silly introduction written by Tom Brevoort. The first time I noticed Jack using quotation marks to make a point I thought to myself -- “What the heck is THIS?” Oddly enough, my dottering father does the same thing whenever he writes a letter but the similarity ends there. I think. All I know is that (what I call) those “crazy Kirby quotation marks” were being put to (over) use by the time Pacific Comics started publishing Captain Victory and Silver Star. And if my memory serves me, they were STILL being used when Jack went back to DC to do the Hunger Dogs graphic novel and the Super Powers maxi-series. So why did Jack use “quotation marks” to put emphasis on “specific words and phrases” when plain old bold face type would have worked just fine? I’m not exactly sure. I am confident about one thing: Jack the “editor” wasn’t about to interfere with anything that Jack the “writer” put down on the printed page. And that rule-of-thumb also applied to whoever lettered Jack’s books (we certainly know it was true when it came to inking – just ask Mike Royer). We’ll never know if the use of “crazy Kirby quotation marks” ever existed when Jack was at Marvel in the 1960’s because Jack never “wrote”. Let me clarify -- Kirby never wrote in the sense of turning in scripts and certainly wasn’t writing word balloons on the art boards. If Jack was “quote-happy” when he returned to Marvel in the mid’70’s we never saw them because even if they were present, because Archie Goodwin or whoever else was managing editor t the time no doubt politely whited those silly “quotes” out or erased them altogether. Which brings me back to Jack Kirby’s use of quotation marks. Maybe Jack felt that by using quotes on certain words and phrases they stood out more than by using bold face type. Kind of like Mike Meyers/Austin Powers using his fingers to put everything into quotes. Silly? Absolutely. Annoying? You bet! But Kirby comics wouldn’t be nearly as enjoyable without those crazy Kirby quotation marks. I caught wind of this late last month and I have to say I’m shocked and depressed over “Death of the New Gods.” I guess if I had to choose, I’d say I was more depressed, because it seems like after all these years the good folks at DC feel the only way to make any headway into the development of a character (or characters in this case) is to kill them off. Now I know that maybe by killing off all (but one) of the New Gods, Jim Starlin is alluding that the characters in the Fourth World can be re-introduced or re-tooled or re-whatever’ed and then re-presented into a new series. But I’m just not sure that killing off the New Gods is the way to do it. I’ve never been a big fan of killing off any existing comic book character. I certainly didn’t know Jack Kirby -- that’s not counting me meeting him at the 1975 MiamiCon (see my post below) – but from what I’ve learned and read from others like Mark Evanier, Jack Kirby was all about LIFE and not DEATH. So I have to wonder how Jack would have reacted to all this killing – especially the killing of a group of characters that continue to make money for DC and especially ones that were so near and dear to his heart. Granted none of the re-launched series of the New Gods have lasted more than a couple of years each. Some even less than that. You’d have thought that maybe John Byrne could have done something special when he had the chance. Never happened. Mark Evanier had a fun go at it a few years back in a dis-jointed kind of way. I’ve always felt that maybe it’s the way in which the New Gods were presented. Beats the heck outta me what the secret is. I really enjoyed Walt Simonson’s take on the New Gods and THAT didn’t last either! Anyway, Jim Starlin seems to think it’s time to do away with the Fourth World and he’s just the guy to do it. I’m not entirely convinced. I’ve always run hot and cold on Starlin’s art: loved him on Shang Chi way back in the day. Enjoyed his run on Warlock and especially Pip the Troll (which I recall was a homage to Jack Kirby -- cigar and all). I thought Cosmic Odyssey was o-k, but Starlin only wrote it and didn’t illustrate it (that was early Mike Mignola if I’m not mistaken). Not to mention that over time Starlin’s characters seem to gain weight. 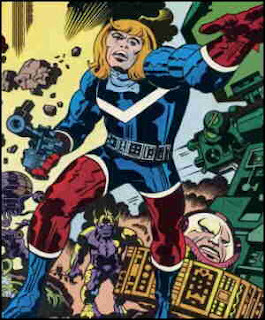 Kind of the same way Jack Kirby’s characters got bulkier over the years. Startlin’s version of Orion is the beefiest I’ve ever seen. And I don’t necessarily mean that as a compliment. You can read an interesting interview with Jim Starlin regarding Death of the New Gods by clicking here. Anyway -- so over the course of this 8-issue mini-series all the New Gods will bite the dust. Silly me -- I didn’t even realize LightRay got whacked in another series. And now Big Barda. And that’s just the beginning! Issue #5 is already being pre-ordered and I’m sure by issue #8 there will be more carnage and mayhem going on than even Orion can handle. That is if he’s still around by then. My only solace: if they can kill Superman and bring him back I’m sure the New Gods can work their way back into the DC Universe. Hopefully it’s just a matter of a time. After a 22 year Air Force career working as a broadcaster/journalist for the American Forces Radio and Television Service, I am now happily retired and living in Southern Italy with my wife, daughter and cat.